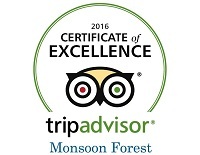 Monsoon Forest redefines the idea of conservation-based tourism. KNOW WHERE YOU ARE HEADED! • The lodge is oriented to cater to wildlife lovers, bird watchers, nature photographers, researchers and meditators. This place is ideal for those who are looking for a great wildlife experience, a quiet relaxed peaceful getaway or you wish to meditate and enjoy the benefits of Yoga. • Our rooms are all very well equipped and are large in size. 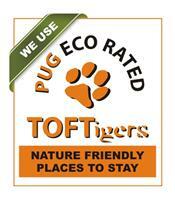 All items have been carefully chosen and used in the rooms such as mattresses, duvets, clean linen, pillows, mats etc. These are not overly luxurious but give you the comforts of any standard hotel. All rooms and cottages are air-conditioned. Hot air blower heaters are provided in winter on request. Please let us know if there is anything else you require such as hot water bags, extra blankets or pillows. • The toilets are equipped with hot & cold running water & showers. All toilet amenities such as fresh towels, soaps etc. are provided of standard quality. • To get hot water from your tap/shower, please turn the tap to the left and leave the water running for a short while (preferably in the bucket, for re-use). When the hot water starts, adjust it to suit your temperature. • Your towels are changed on a daily basis, but if you feel they do not need replacing please leave them hanging on your towel rack. We try and use as little water and soap as possible. • In the event of electricity failure the fans and lights will run on inverter power. The air-conditioning may not work then. The chances of power cuts are very low. The power supply is 220V. The plug size is Standard English. As our focus is on developing a nature-centric experience at the lodge, we do not have electricity generators which cause sound and atmospheric pollution. • We do not have intercom facility in the rooms. Should you require anything urgently you may call the hotel staff from your mobile phone or you may ask for a mobile phone from the manager which you can use during your stay. The numbers will be given to you upon your arrival. • If you are not going for a safaris, our in-house naturalist will be happy to take you bird watching and on a nature trail to showcase the various elements that Bandhavgarh has to offer. There are set timings when the walks are conducting every morning and evening. • Please pre-book your safaris either with us or directly on. The safaris are in great demand. Only a part of the safari quota is available to book online and the other is sold over the counter. To avail safaris directly in Bandhavgarh one need to cue up early in the morning outside the park to secure the ticket which can be unnerving. Once your tickets are booked you may book the 4WD vehicle with us. In effect you will pay for the safari ticket, the 4Wd vehicle and the fee for the guide who will be assigned to accompany you from the forest department. • It can sometimes be quite chilly outdoors at night, even in summer, so do dress warmly. • Even though the camp is fenced off, wild animals occasionally do enter and pass through the camp. Guests are requested not to walk alone at night, Members of our staff will be happy to accompany guest back to their tents & cottages. Please do not walk barefoot anywhere, not even inside. If there are unwanted guests (insects, geckos, scorpions etc.) please alert our staff who will remove them. Macaques and Langurs visit the lodge occasionally. Please ensure that you keep eatables away from them. Failure to do so may encourage them to become raiders. • If there are wild animals in the surroundings, the village dogs may bark at night causing disturbed sleep. • We do not have an in-house laundry. We send it out to a nearby facility in the village hence we are unable take responsibility for them. If you would like your clothes laundered, please place the items in the bag and they will be laundered within 24 hours. Please note that laundry charges are extra. • We advise you to be careful with your valuables. If there is something you would like to keep safe, our manager will be happy to assist you. • Bandhavgarh does not have a bank to change foreign currency. The nearest ATM is in Manpur, 10 km from the lodge. Please contact our manager for any assistance. • Umaria is the closet town that has a hospital. If you have any medical conditions that we need to be aware of, please inform our manager. We do not have doctors on call. • If you’d like to leave a tip for our staff at the end of your stay, please do not tip any of our staff individually. There are many unseen hands who work hard to make your stay comfortable, and we strive to divide tips between the entire staff. Please leave tips in the Tip Box. You may tip the Park Guides, Mahouts (Elephant Drivers) and the Naturalists directly. • Check – out time is 11 am & check-in time is 1 pm. • We do not have the facility to charge credit cards at the lodge. We recommend that you carry enough spare cash to pay for hotel taxes and any extra expenses that you may incur. • We serve home-cooked Indian food, with spice and chilly levels kept moderate. If you still find the food too hot for your taste do let our chef know. Please inform us if you have any special dietary requirements. Breakfast is served between 8 and 11 am, depending on the timing of morning safari. Lunch is usually a light meal served between 1 and 2.30pm, just before the afternoon safari. Dinner is served from 7.30 pm. It can sometimes be quite chilly outdoors at night, even in summer, so do dress warmly. We stock a limited selection of beverages at the lodge that is available at the Baithak. We can have drinks sent to your tents and to other guest areas. All beverages are chargeable. If you require a packed meal at your departure please let us know in advance. • We are happy to set up free cookery lessons. If guests are interested in knowing how a particular dish they liked is made, we can arrange for them to learn from our cooks. Our staff will be happy to learn something from you, if you would like to teach them. • We serve filtered RO (Reverse Osmosis) processed water that is safe to drink. Please let us know if you prefer bottled water at all times. • Yoga can be offered everyday which really energizes and relaxes your system. We can arrange for the services of a local masseur whose specialty is traditional massage with warm mustard oil. The best time-slot for a massage is between safaris. The massage will be given in the Panchatatva cottage. Please speak with our manager to book these services which is chargeable. • An internet connection is available for guests in our office area. It might be erratic at times. • We encourage guests to help us afforest the surrounding jungle and grow sustainable forests of native broadleaf trees. Please speak with our manager to sponsor our tree-planting program.